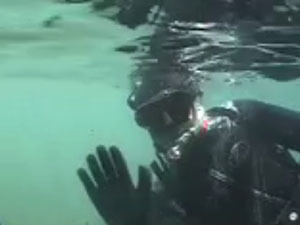 Diving continues in Novy Svet. Below the droning hookah compressor, divers work diligently at the ends of the 60-foot-long yellow hoses. Not everyday produces beautiful artifacts, but the systematic excavation of the site requires that every grid square be excavated with equal attention. There is still a lot of work to be done and excavation here will continue for the rest of the season while other team members begin the long awaited survey for undiscovered wrecks off Cape Meganom. The Black Sea is home to many types of fish as well as wrecks and some join us for a free meal stirred up from the sediment by the excavation's activities. The sea dog hides under an amphora sherd, an often playful fish, he seems more curious than afraid of the diver that has discovered his hiding place. The more menacing scorpionfish receives it name from the mildly poisonous spines on its back. This one in particular seems fearless and is hard to spot against the rocks and seaweed. His presence keeps divers alert at all times. Emerging from the seafloor, a large amphora sherd with intact handle is excavated by archaeology student, Claire Collins. This sherd is large enough in profile to give us an idea of the vessel's original size and style. With the arrival of the Polish team from Krakow's popular diving club, KRAB, comes a large inflatable boat with a 25 horsepower outboard. While far from the fully outfitted research vessel we hope to have in the future, this boat will serve our means for the preliminary survey off the Cape of Meganom this season. Setting up the boat is simply a means of inflating it with compressed air from a scuba tank and walking it down the beach to launch. Here in Meganom the hot beach is full of vacationing families and surrounded by hills brown with sun-scorched vegetation. A large abandoned barge washed up on the rocks looms over the beach, an artifact itself from the Soviet era. The blue paddle mounted upside down at the stern of our inflatable boat serves as a temporary mount for the side-scan sonar transducer. This device, powered only by a small 12-volt battery, can survey an area 350 feet wide to 150 feet deep and map the seafloor in three dimensions. Today was only a test, but everyone is excited that the instrument is working perfectly, even with such jerry-rigged equipment. Even the GPS unit reads our position with precision to 10 feet. Our director, Dr. Zelenko, takes a picture in commemoration of the happy moment, but everyone knows there is much more to be done and planning for the week ahead starts as soon as we return to shore.